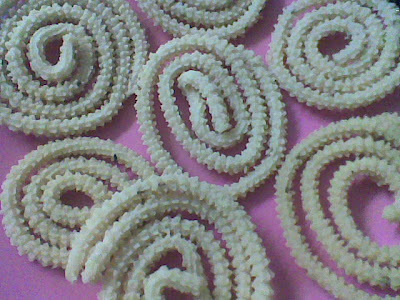 This murukku is a must during the Diwali in my household. These chakklis just melt in your mouth. It is like eating an ice cream. They also stay that way for a long time. Sometimes you get to taste very good things out of simple and few ingredients. This is one such thing. Take a white clean cloth and put the flour in it and tie it. Steam this in either Idli or pressure cooker for 20 -25 minutes. Take it out and let it cool. Untie the knot and put the flour in a plate and crumble it. Sieve the flour well without any lumps. In a vessel mix the flour, cumin seeds, salt and melted ghee and by adding water knead it into dough. Cover the dough with a damp cloth. Take a large ball from the dough and with the help of murukku acchu with the star plate in place squeeze the dough into round shapes on a greased plastic sheet or a plantain leaf. Heat the oil in a kadai. When hot reduce the flame to low. Now put the squeezed murukkus by one or two at a time in the oil and fry them till they are done. This must be done over a low flame to maintain the color and the crispiness. The murukus are ready. Store them in an air tight container and enjoy to your heart’s content.